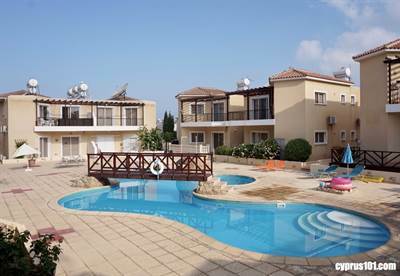 This spacious 2 bedroom, 2 bathroom apartment for sale in Kato Paphos is within easy walking distance to local amenities, including Kings Avenue Mall and Paphos harbour. Being situated on the top floor of a two storey block, the property benefits from being detached on all sides. The accommodation features a spacious open plan living area with comfortable lounge and large kitchen/diner. The kitchen is well equipped with plenty of cupboard and worktop space. Appliances include built-in oven, electric hob, fridge/freezer and washing machine. Sliding patio doors in the lounge provide easy access to a large balcony overlooking the attractive communal swimming pool with central bridge and surrounding terrace. A hallway leads to two good size double bedrooms with fitted wardrobes and integral dressing table. The master bedroom has en-suite facilities and there is a separate family size bathroom accessed directly from the hallway. This property is ideal as a holiday home/rental investment and/or permanent residence. Furniture is included and there are full title deeds.